Glass is a movie full of thrill and shocking twists and turns, but does it live up to the hype? Many people have been anticipating this sequel to Unbreakable (2000) and Split (2017). Director M. Night Shyamalan, who also served as a writer for Glass, has been working on this film for almost two decades — 19 years to be exact. In this movie, we see the return of the hero and villain of Unbreakable, David Dunn (Bruce Willis) and Elijah Price (Samuel L. Jackson), who also goes by Mr. Glass. 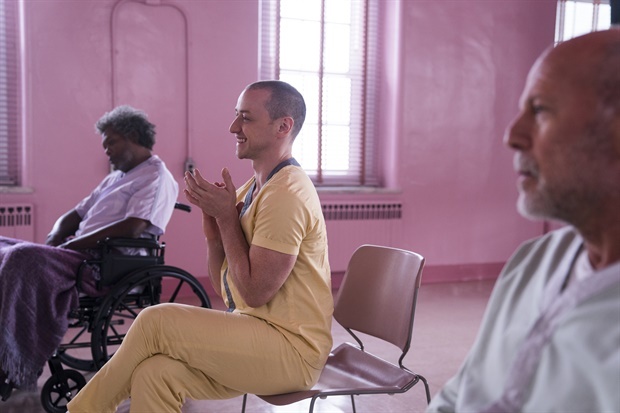 The overpowered hero and the brilliant mastermind meet Kevin Wendell Crumb (James McAvoy), who suffers from DID, and whom the audience was introduced to in Split. These three men are held in a psychiatric ward for their supernatural abilities, where psychiatrist Dr. Ellie Staple (Sarah Paulson) attempts to convince them that their “abilities” can be explained scientifically. She has each of them recall the first moments they felt like they were different than others, and explains how each of their miraculous feats were simply in their heads. The beginning of the movie starts out very slow, with odd pacing and a hard-to-follow storyline. The viewer is thrown into the movie and, unless the audience knows the storyline of the previous two films, it can be a bit confusing to watch. There are also several points with some very strange cinematography choices, as well as some plot holes that are difficult to look past. Towards the end of the movie, however, are when things get interesting. The story picks up, and the audience can’t help but sit on the edge of their seats as the action unfolds, and gasp as jaw-dropping revelations take place. James McAvoy does a fantastic job portraying each of his 23 personalities. Acting as one character is already difficult enough, but being able to switch between the separate identities in an instant is astounding. He is also able to give each of his identities their own unique personality, making the portrayal of DID work incredibly well. Those who enjoyed Unbreakable and Split will definitely appreciate Glass as well, but it’s definitely a good idea to brush up on those films before seeing this one. It’s a movie full of thrills, mystery and action and can be seen in theaters January 18th.